I’ve been hoping to start collecting interesting photographs (particularly post mortem ones), and that all began today when I picked up a few curious bits and pieces for not very much. I hope to share some of my more interesting pieces. 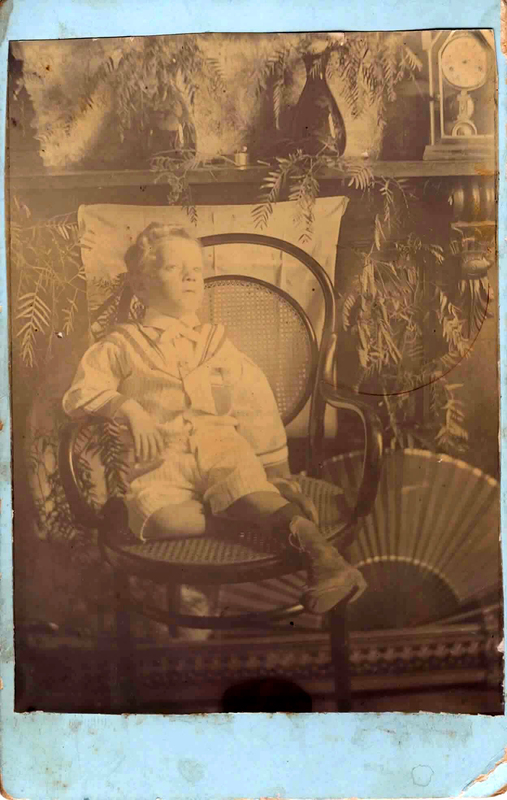 Probable post mortem photograph of a little boy. There is something not quite right about his eyes and positioning in the chair. The photograph didn’t scan so well, so I have brought up the contrast with Photoshop. It was found tucked away in a box of old photographs at the Chapel St Bazaar in Prahran. I dearly would love to know more about this photograph, but there is no information on the back. I can only hazard a guess that it looks like very early 20th century (but I could be wrong, if someone could shed some light, I’d be grateful!). The chair seems reasonably modern. From first glance, the boy seems to be quite healthy. I wonder what it was that led him to his untimely death. It seems that the family have decorated the sitting area with tree fronds. The oriental fan at the bottom right hand corner is curious too. Perhaps it was a souvenir? The more I look at the photograph, the more haunting it seems. This little boy’s image made it all the way through history, his likeness preserved and finally digitized. Such a wonder is photography. For what it’s worth, I think that you do indeed have a genuine post mortem photograph. A very lucky buy! As well as looking pretty, the plants might well have been scented and laid out in order to cover any unfortunate odours from the body – it was fairly common practice to do that.